Ford will start production of its all-new Focus (shown) in Russia by the middle of this year. Strong demand for the previous-generation Focus helped Ford boost its Russia sales 10% to 90,166 units last year. The Ford Focus ended the Renault Logan's one-year reign as Russia's top-selling foreign car. After finishing 2009 second to the low-cost Logan, the Focus won the 2010 race 67,041 to 62,862, according to data released Thursday by the Association of European Businesses (AEB). The Focus turned a tight 11-month race into a runaway victory by outselling the Logan 8,359 to 6,743 in the final month of the year. 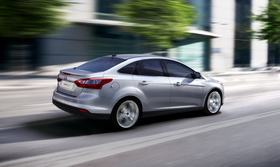 The Focus and Logan finished fifth and sixth in overall Russia sales. Lada models held the top four places led by the 2105/2107 from Russia's No. 1 automaker, AvtoVAZ, in which Renault SA has a 25 percent stake. Chevrolet defended its place as Russia's best-selling foreign brand. The GM subsidiary sold 116,233 vehicles in 2010, an 11 percent gain over 2009, to end the year No. 2 overall. AvtoVAZ remained the dominant No. 1 with full-year sales of 517,147 units, up 48 percent from a terrible 2009 when it nearly collapsed due to the global economic crisis. The Russian government rescued its national automaker with loans in 2009 and by launching an incentive program in March that offers car owners 50,000 rubles (about $1,660) to swap cars that are at least 10 years old for new models built in Russia. Combined with a reviving economy in general, the subsidies helped boost December sales 60 percent to 204,586 cars and light commercial vehicles and helped increase full-year sales 30 percent to 1,910,573, the AEB data shows. The program received approval for more state funding in September 2010 when Prime Minister Vladimir Putin committed another 14 billion rubles to extend the program into 2011.